Displays route ETA for the campus shuttle on a Pebble smartwatch. Campus shuttles are an important way University of Cincinnati Students get around campus. This is especially true for two of our team members who have classes on East Campus and are involved in research or student organizations on West Campus. It can be difficult to pull out your phone, navigate to the campus shuttle page, and check the status while hurrying across campus to get to the shuttle stop. 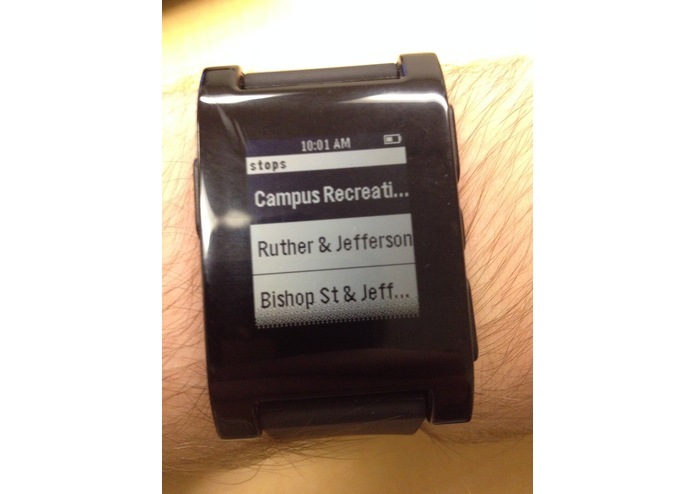 This project addresses this inconvenience by allowing students to check arrival times using a Pebble smartwatch. In addition, because our app uses much less data than loading the full campus shuttle page it can be used in cases of reduced or intermittent connectivity; which are common at certain locations on campus. This project also uses the Strap api to collect usage information. In particular, it records the route, stop, and ETA each time it is used. This could be used to evaluate the popularity and response time of different stops in order to evaluate and adjust shuttle schedules. 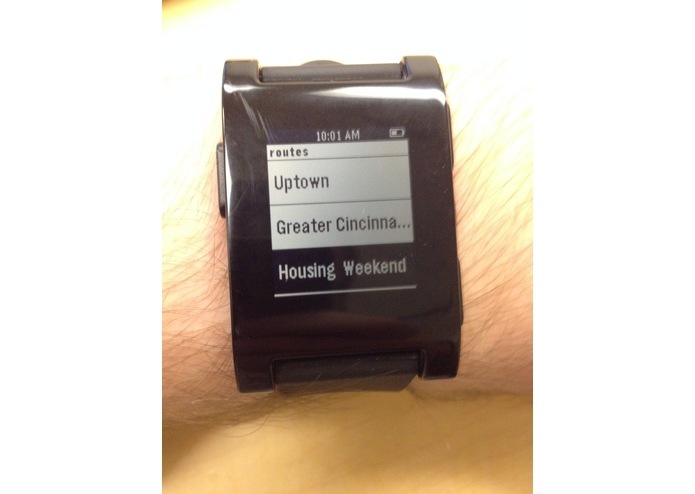 This app was specifically designed for the University of Cincinnati campus. However, with minor modifications it can work with any shuttle system that uses DoubleMap.